Here’s a really simple dessert that is suitable for any occasion and makes use of less than five ingredients. It can be put together very quickly when you are craving something sweet. However, consider yourself warned - it IS loaded with calories. The other day I was going through my food cupboard and came across some canned pineapples and a long-forgotten can of condensed milk, stashed away at the back. I immediately knew what I had to make. This is a recipe for a simple and sweet pineapple pudding. *Do not use fresh/frozen pineapple if you are using gelatin as the gelling agent. The fresh fruit contains an enzyme that breaks down the protein in the gelatin, it will fail to firm up and the end- product will be watery. Canning/heating pineapple breaks down the enzyme and it can be used without a problem. Strict vegetarians/vegans are better off using agar-agar or other similar substitutes. Though we are Kerala brahmins and most of our clan practices strict vegetarianism, we only do what we find practical and convenient. But I digress… before you lose interest competely, let me continue with the recipe! Dissolve an envelope of gelatin in a cup of hot water. Stir to mix everything well. Add the drained and crushed pineapple to the condensed milk along with the cranberries and mix well. Add the dissolved gelatin & mix again. Pour into molds (I used my muffin pan) and refrigerate for an hour or so till the pudding sets. Sprinkle a few cranberries on the top and serve cold. Verdict: It was a little too sweet even for me, considering the fact that I am the one with the sweet tooth in the family, but my husband loved it. I would cut down on the amount of condensed milk used the next time I make this. That looks beautiful TBC...and simple too...Pineapples go well with condensed milk..the pic is very nice! Hi... this looks great, easy and delicious! I add heavy cream (or soy cream) to break the sweetness. I am making your hummus this evening... can I post it on my blog? Thanks! yummy...love individual sized dessert..should make this with agar-magar ;)i know..bad joke.. 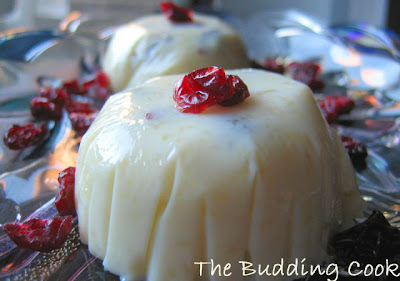 The pudding looks like a grogeous beauty! And great tip regarding the use of crushed canned pineapple. While cooking with pineapple and papaya thats one thing to keep in mind always (and someone like me surely would tend to forget it!!). Now, may have a lil' bite of the pudding, plzzzzzzzz :). Can i have a piece...gosh its so tempting. Looks very simple and delicious. I must try this soon. That looks so pretty and delicious. My kid would love this. 1st time here. The pudding looks fabulous. Wow! Silky and custardy. Beautiful TBC. wow pudding looks awesome sure my try next :) i never knew of the fresh pineapple breaking the enzymes thanks for the info! the pudding looks so nice and cute. a very different kind of pudding though right? i make something similar, i liked ur idea of setting it individually! Yummy Yummy!!!! What a treat to eyes!! TBC - the pudding looks lovely. Can you pass me a spooon, or will I have to use my fingers. I am ready to dig in both ways. Love it....n pineapple is one of my favorites fruits for that matter. That looks awesome, wish I could taste it! Wow!pineapple pudding looks delicious. You seem to be very creative.I also liked the way you reviewed your recipe. I think i too have a tin of pineapple in my pantry..got to try this.. Thanks for sharing. Love the frills...almost looks like a table draped with a long tablecloth. Seems simple too. Thanks for sharing. how did you like the curry? you did not tell me that? the email part works for ppl who have outlook or lotus enabled. sorry about that. now I am trying to change it so that who do not have such option also can email me. MMMM calories or not i love them. It looks delicious. Wow! This looks so good and so simple. Thanks for sharing! isn't it someone's birthday today? happy birthday to you. Wow Pineapple pudding looks awesome! Beautiful picture. Thanks for sharing this nice recipe. Btw, how did you get those nice frills? Those pictures are tempting though I don't consume gelatin. Shankari,Roopa, Sharmi,Richa, Bhags, Daily meals, Cinnamon, Nags, Shella, Asha, Padma, Madhavi, Sirisha, Bindiya, Grihini, Hema, Sreelu, Shweta, Sunita, Happy Cook,Nirmala, Rohini,Shanti & Seena-THANK YOU so much for taking the time to comment here. Cris- I saw your version & I like what you have done. Beautiful pics too! 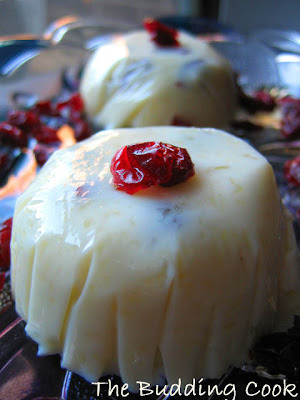 Latha & Suma- you do not have to use gelatin. I have given links to other substitutes in my post. Hopefully one of those would work for you. That's one cool dessert! Thanks for the tips. Looks like a tough life for vegetarians! :) Btw, happy bday! Sona-thanks dear:-)you are too kind. Kamini, there u are! where have you been? no new posts for a long time now. I hope everything is o.k..
Wow..same pinch..I m the only one at my home wt a sweet-tooth! !Ok..I shall reduce cond.milk to 1/2 can then..wd revert back!Thanks for visiting my blog..keep coming back! !I m adding you on my blogger list. Thanks again for lovely recipe posted!! Purnima: thnaks for stopping by & thanks for adding me to your list:-)Do let me know how the pudding turns out with just half the amount of condensed milk. I too have to try that out. also called as china grass,this is basically a dried seaweed (algae to be exact ) and has similar gelatinising properties .For this recipe you could use about 5 strips of agar of about 6 inches length,cut them into small strips ,dissolve in hot boiling water and it can be added to the recipe easily! Do give it a shot when you can. You will not be disappointed. You might want to cut down on the sugar a bit 'cos mine was a little too sweet. Thanks for sharing this simple recipe. I prefer to go with agar-agar. Will try it sometime and let you know how it turned. This looks cool and refreshing. I like how it isn't very complicated but still sounds delicious! I'd like to include your recipe on our blog, please let me know if you're interested.